Pat Fenlon has revealed he’s already eyeing the January transfer window with a view to further strengthening his squad despite having made ten signings over the summer. 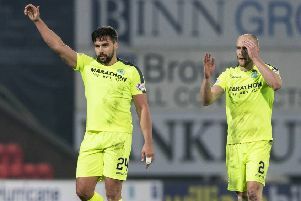 Although he insists he’s happy with his current squad, the Hibs boss admitted there are still areas he’d like to strengthen should finances permit with one aim being to add more pace on the flanks and up front. dozen first-team regulars on almost a weekly basis although the likes of skipper James McPake, Ryan McGivern, Owain Tudur Jones and Paul Cairney are all back in contention. Fenlon said: “I think when you look at the squad the balance is quite good when we have everyone available. We’ve been missing four, five and six for most of the season so far but hopefully most are on the way back. Right back has been a problem and Tim is another three or four weeks away. Hibs’ Under-20s will be seeking a seventh straight win in the East of Scotland League when they face Berwick Rangers Reserves at East Mains tomorrow, James McDonaugh’s side already nine points clear at the top of the table.